Have a question about the Armor Dive Flag Mesh Duffel Bag? Promote your sport and industry with a bag that proudly says DIVE. This rugged PVC coated 600D polyester mesh bag with YKK Delrin zipper and side pocket with traditional red and white diver down flag on the end. 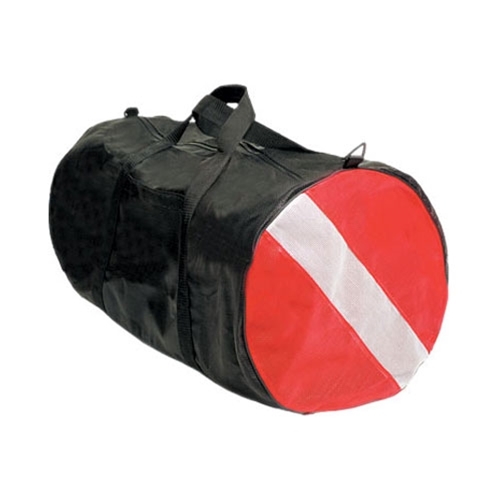 This mesh duffel with top grab handles is a good choice for personal gear on local dives. Having this mesh bag folded up and in your travel dive bag allows you to keep your expensive roller bag dry and ready for the trip home without exposing it to the elements and dive boat crews. When you're ready to rinse your gear after a day of diving, simply drop the entire bag in the rinse tank and hang up to dry.